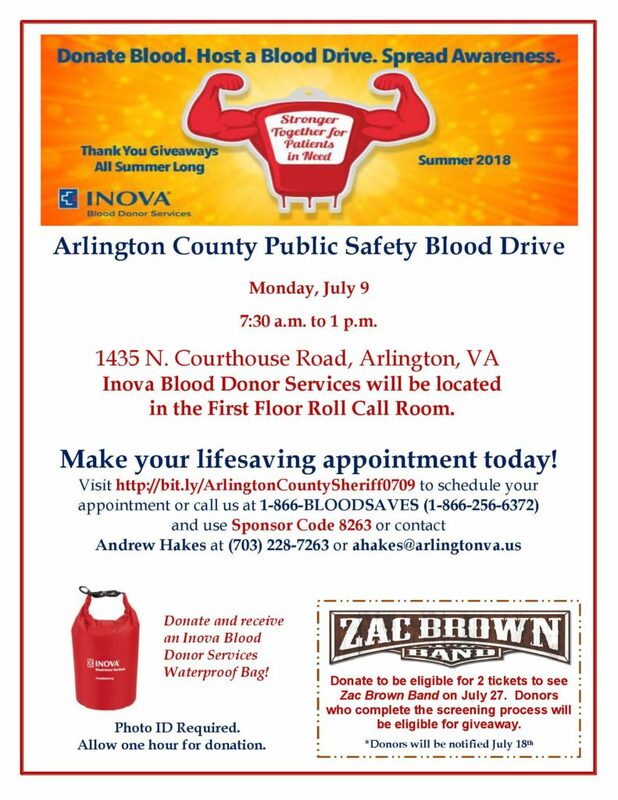 ARLINGTON, Va — Arlington County’s emergency responders are dedicated to keeping the public safe and see first-hand how the need for blood affects our community. 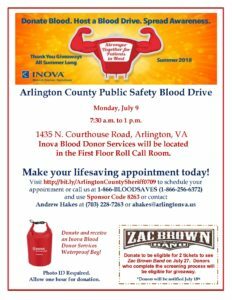 On July 9, the Arlington County Police Department, Sheriff’s Office, Fire Department and Public Safety Communications and Emergency Management are partnering with Inova Blood Donor Services to host the annual summer Public Safety Blood Drive to help reduce the mid-summer blood shortage. Community members are asked to join public safety, roll up your sleeves and help save a life by donating blood. TIME: 7:30 a.m. to 1 p.m.
HOW: Schedule your appointment online or call 1-866-BLOODSAVES (1-866-256-6372) and use Sponsor Code 8263. Walk-ins are welcome. A photo ID is required to donate. Allow one hour for your blood donation. For additional blood donation information, visit the Inova Blood Donor Services website.